Here at over 10,000 ft above sea level, 4 hrs north of Taos, rests Leadville. 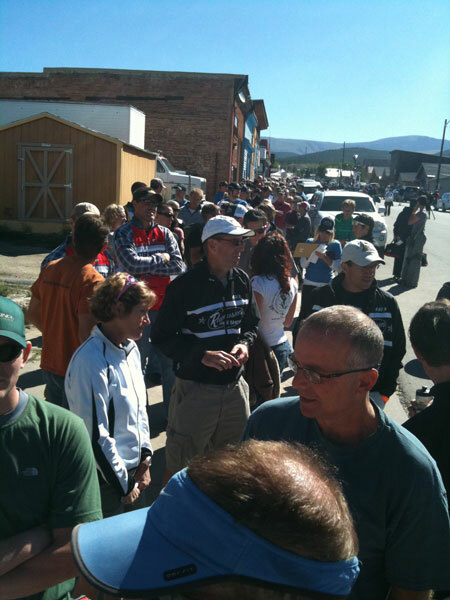 A sleepy little ex-mining town which plays host to one to the toughest and most scenic endurance challenges available. The Leadville Trail 100 Mountain Bike. An obscure little race until a few years ago when Lance Armstrong decided to race. And once he mentions it, millions of people know in seconds, thanks to his 2.6 million twitter followers. His tweets have more readers than the LA times or the Wall Street Journal. Talk about the power to rally! A few of us gathered here to support Kyle is his quest for the dreaded belt buckle. Vance, Caroline, Julie, and Andrew were the support crew. Lance had just had a poor showing at the tour and ended up not wanting to do anything this challenging. 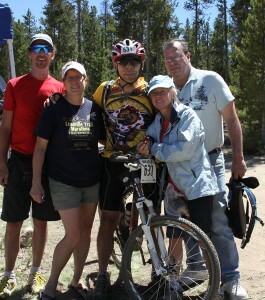 But Leadville did attract his teammate, Levi this year. The crowd for registration was huge, with the 1300 entrants and another several times that here to watch and support. We planned on attending the pre-race briefing but there wasn’t enough room in the building to handle all the interest people. Kyle didn’t even get in! Race day started typically early, 4AM. We were in a rented home about 10 miles out of town up some crazy long dirt road with a couple of gates that needed to be opened and shut along the way. One of our crew brought his (or her) mtn bike and planned on riding at least some of the course. The course is not really technically tough, which is good for the road riders in the race, but tough enough so the mtn riders do have an obvious advantage in the technical areas and downhills. The day was perfect, sunny and 65ish, and played a part in the course record Levi set, 6:15. Kyle rode in at just over 11 hrs and said this was as proud as he’s ever been of a consolation prize!